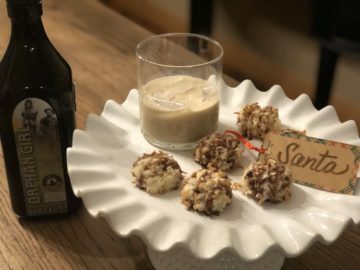 This year give “Santa” cookies and milk he’ll really appreciate *Wink, Wink! 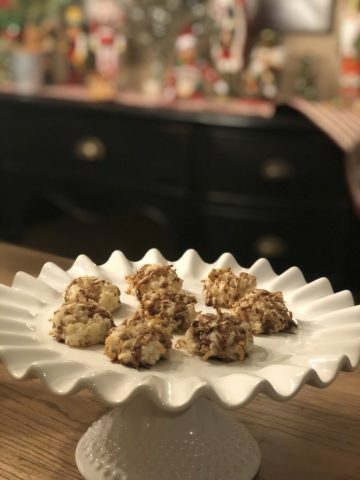 * Yep, it’s that time of year and while you are getting ready to start your holiday baking, consider making this 10 minute recipe for the easiest macaroon around. Preheat your oven to 325. In a bowl, combine salt, sugar, flour and coconut flakes until well mixed. In a separate bowl, lightly mix wet ingredients, Orphan Girl and egg whites. Combine both bowls, and mix until a sticky dough forms. Using a Tablespoon scoop your dough onto a greased cookie sheet, carefully placing the perfect circles. Bake for 20 minutes or until golden brown. While cookies are cooling, make your Orphan Girl drizzle. Take your chocolate chips and place them in a microwave safe bowl. Microwave them for 30 seconds, stir them, then add your Orphan Girl and microwave for another 30 seconds. Mix chocolate until silky. Using a spoonful of your drizzle, quickly pour the chocolate onto your coconut macaroon. Continue until all your cookies have some Orphan Girl drizzle on top. Allow the cookies and chocolate to dry, and they are ready for gifting or enjoying all to yourself. Mmmmmm… Happy Holidays, Team Headframe.